Canada’s housing industry is more important than ever as a driver of the Canadian economy, and luckily it is on solid footing. Those are two conclusions we reached here at Royal LePage, after taking a good look at the data contained in the National Balance Sheet Accounts recently released by Statistics Canada. The National Balance Sheet Accounts are a sweeping look at the sum of Canadians’ incomes, assets and debts. When we talk about assets, real estate has, of course, always been a key component, generally representing the biggest and most important holding of Canadians. What we are seeing now, though, is that housing wealth is becoming increasingly important on a relative basis. Fifteen years ago, in the second quarter of 2000, the ratio of the value of real estate holdings to personal disposable income was about 225. 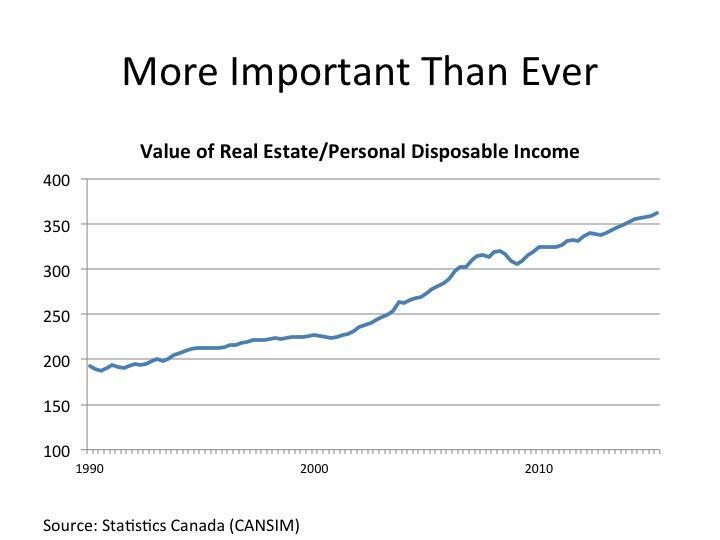 That means that on a national basis, Canadians had 2.5 times their disposable incomes in real estate holdings. That ratio is now up sharply. By the second quarter of 2010, it had grown to 3.24 times, and by the second quarter of 2015 we were up to 3.62 times. That the relative value of real estate keeps going higher is arguably an important factor in Canadians’ confidence about their financial situations. In turn, that makes it more likely that they spend money on their homes, and on everything else as well. Economists call it the ‘‘wealth’’ effect: if you feel rich because your house (or some other asset) is rising in value, you are going to feel better about spending money in general. Of course, the importance of real estate might be an issue if the market was deemed to be unstable. However, another indicator we gleaned from the Balance Sheet Accounts speaks to its stability. 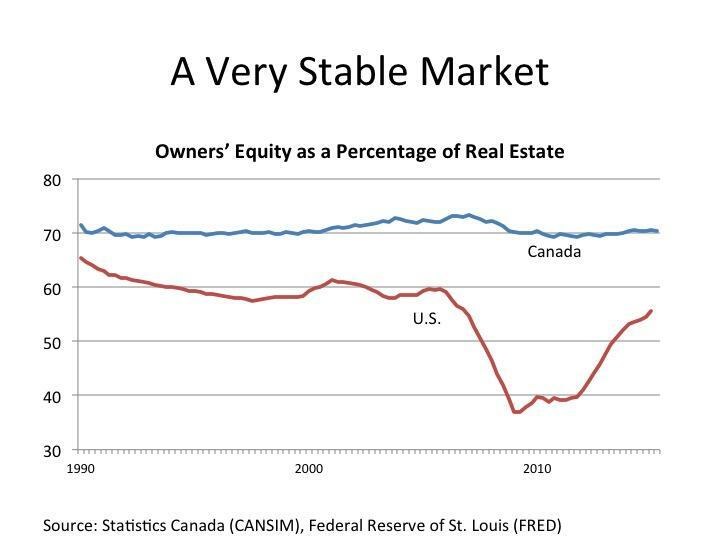 The Ratio of ‘Owners’ Equity to Real Estate’ is a measure of how much of real estate holdings in Canada are actual equity as opposed to debt. In the second quarter of this year, this indicator was at a reasonable 70.43 per cent, which is more or less where it has been in Canada for decades. That suggests that even if Canadians have been taking on larger mortgages or borrowing against their homes, those liabilities have been offset by a rise in the real estate market. It is a big contrast to the situation in the United States. Looking at the parallel measure for the U.S., it is clear that starting around 2006, the ratio of Owners’ Equity to Real Estate started to plunge as Americans pulled money out of their homes. Although that did not impact households’ financial stability too much when the market was rising, once the value of those homes started to plummet the ratio did as well, hitting its lowest point around 2010. In more recent quarters we have seen a reversal almost to the historical norm, which does suggest that the U.S. housing market is on more stable footing that it has been in several years. Still, it is worth noting that Canadians have always had — and continue to have — a much higher equity position in real estate than Americans. That is a reassuring signal about the health of our real estate market. As real estate becomes a bigger part of the Canadian economy, its stability becomes more important than ever before. Any change or disruption in the housing market is going to impact spending decisions and the broader economy almost immediately. That’s why we continue to monitor a very broad range of data to understand the health of the sector. And, it’s also why we continue to be reassured that both housing and the Canadian economy are on stable ground. ← WIN your ClientClick website for a year!